The antioxidant effects of hydrophilic phenols and tocopherols on the oxidative stability in virgin olive oils and in purified olive oil have been evaluated. Total hydrophilic phenols and the oleosidic forms of 3,4-dihydroxyphenolethanol (3,4-DHPEA) were correlated (r=0.97) with the oxidative stability of virgin olive oil. On the contrary, tocopherols showed low correlation (r=0.05). Purified olive oil with the dialdehydic form of elenolic acid linked to 3,4-DHPEA, an isomer of oleuropeine aglycon, and 3,4-DHPEA had good oxidative stability. 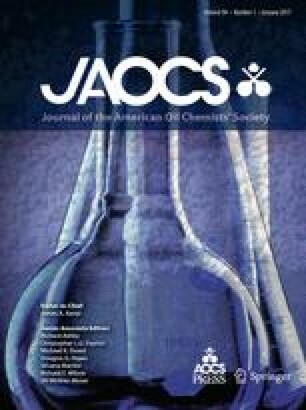 A synergistic effect was observed in the mixture of 3,4-DHPEA and its oleosidic forms with α-tocopherol in purified olive oil by the Rancimat method at 120°C.